Danielle Worster used it to deal with the overwhelm when she started working for herself. As a new entrepreneur one of the greatest challenges is self-managing your time. Having previously worked in a bustling open plan office, I am now adjusting to life in a quiet, solitary room. My instinct is to do things intuitively, as they come up or as I feel like it. This can lead to procrastination, feelings of failure, then working late to compensate. Does this sound familiar? In addition to being solitary, I now find myself with a bewildering array of tasks that are all urgent, important and unfamiliar. Which comes first, a business plan, a business licence or marketing to potential customers? How can I be strategic when I feel I am already putting out fires? I came across the pomodoro technique totally by accident. It is simple. 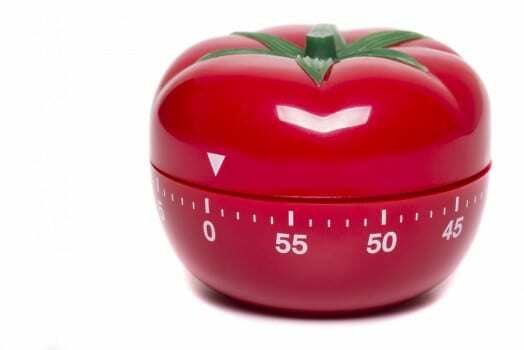 You are instructed to set a kitchen timer (the tomato or pomodoro timer) to 25 minutes. You determine how many 25 minute periods you need, then complete the task. I modified the time to 30 minutes as this seemed more meaningful (and I am not limited by what a tomato timer can do). I sat down, jotted a list of 4 things I needed done (read a chapter of my marketing book, do the quiz, read a strategic planning document and summarise my burning to-do list). I set the timer on my iPhone for 30 minutes and read my chapter. Then I did the quiz to see whether my target market was correct. In between these I took a 5 minute yoga stretch break – this is totally necessary as it is difficult for me to stay seated for more than an hour. It’s also a mindful check-in with myself – how am I doing? How am I feeling? Pretty darn effective, actually. I did this “off-timer” which could have been dangerous but wasn’t as I felt a pull to get the rest done. My strategic planning document took longer than 30 minutes to read. I read the last part very strategically – what are the salient points? I felt there needed to be time in this scheme for ‘actions arising’ from the material I had read. I stopped to jot down two lists: personal and professional actions. Ah, better and now my mind is clearer. At least 17 minutes extra, off the clock – I need to be careful here. My last chunk of 30 minutes (and I forgot to stretch) now. In my excitement to have my key business to-dos outlined I came in at under 30 minutes! Probably a first for me. I jotted some notes and reflected on this process – my 2 hours plus stretch time and ‘actions arising’ still managed to inflate to just under 3 hours. How did that happen? Perhaps I should mention the chicken sandwich and cheese puffs – lunch was happening concurrently. Come on, there is no way I can be sat at a desk for 2+ hours without food and water being within an arm’s reach! Food is the best bribery. My verdict is: yes, the modified pomodoro timer yielded immediate results. I felt a sense of accomplishment, control and productivity that I do not normally enjoy. Although not all reading material fits cleanly into 30 minute blocks, the technique encouraged me to look for the kernels of wisdom in the document. I was a bit more limber after the stretching too – if “sitting is the new smoking” then building in an active element – walking, stair climbing, going to make a quick cup of tea – is to be encouraged. I encourage everyone to be a guinea pig with methods, incentives and break activities. What works for one person does not work for all. I tend to be very ‘in the moment’ so an alarm to tell me when to stop is a godsend. For others getting into ‘the zone’ may be more of a problem. Lastly and most importantly – be kind to yourself. You are stepping into a new behaviour and having to be flexible to do so. Decide what works for you and bend the rules a bit to make life easier. I intend to modify this approach and see where setting tasks in advance the night before gets me. Also consider what to do with the time left over – stop timer and move on? Or use it to reflect on the current task and how to approach similar future tasks? How good will you feel to have completed all your tasks and leave work on time today? Focus on taking the first step with that feeling in mind.